Motion Controls Robotics Incorporated (MCRI) will define and deliver an integrated material handling system for your manufacturing and/or warehousing operation – either as a part of, or separate from our robotic solutions – using proven, reliable and cost-effective SmartCart Automatic Guided Carts (AGCs). 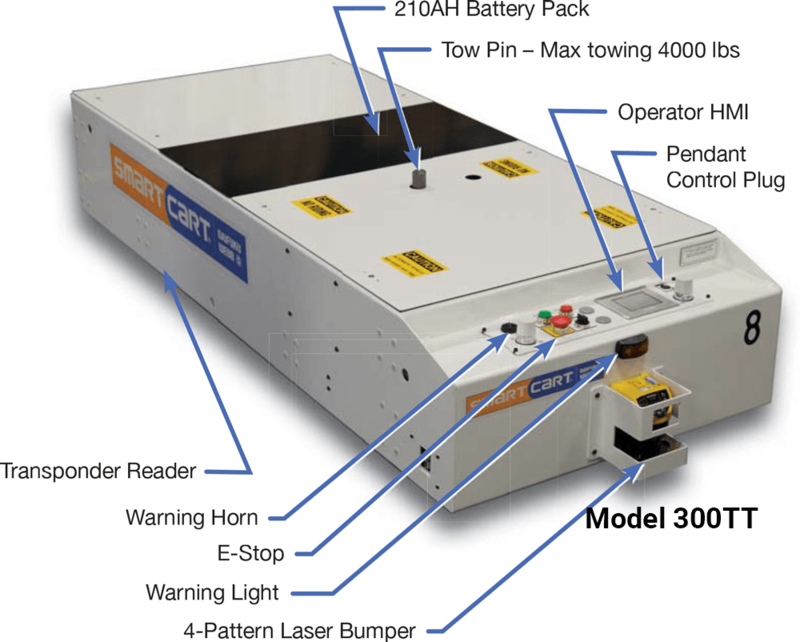 MCRI is a value added reseller (VAR) for the SmartCart Automatic Guided Cart product line. SmartCarts have quickly become the industry leader in this relatively new class of material handling equipment – low cost, yet flexible and very capable automatic guided vehicles that follow a visible, rapidly installed and easily modified path. This product was designed by one of the most widely known and highly regarded companies in material handling, the Jervis B. Webb Company. 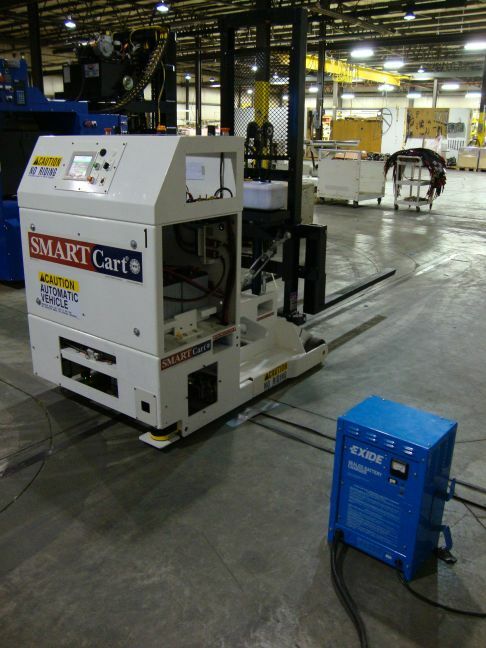 SmartCart Automatic Guided Carts (AGC) are the cost effective material delivery and take-away system for your robotic palletizing/unitizing system, or other robotic work cell. 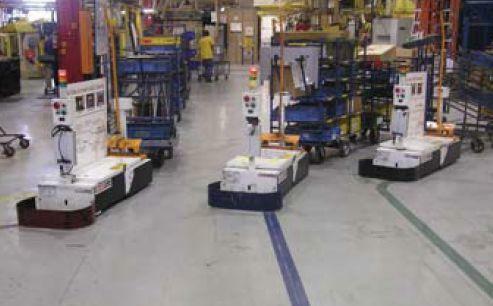 The SmartCart Automatic Guided Cart is a flexible Automatic Guided Vehicle or AGV that is guided by magnetic tape. 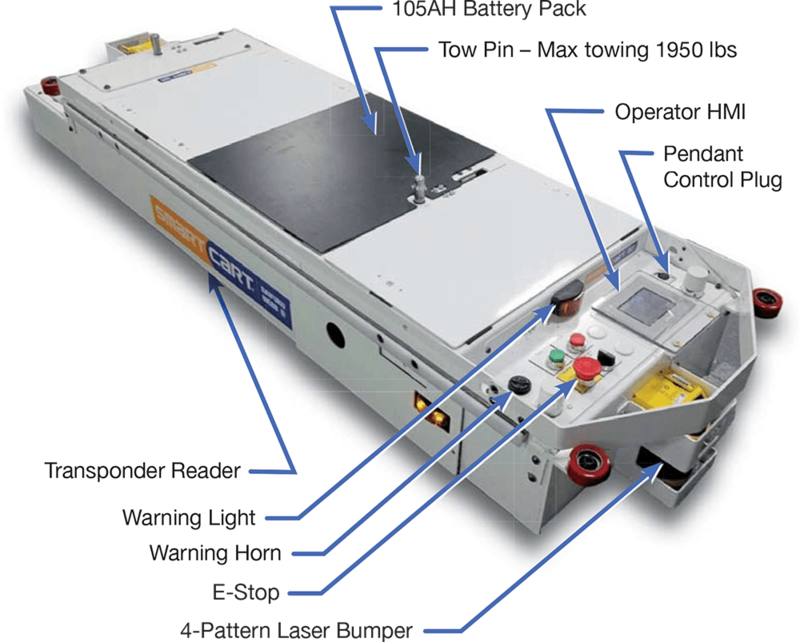 The magnetic tape allows you to quickly install or modify the guidepath in a fraction of the time required to modify laser and inertial guided AGV systems. 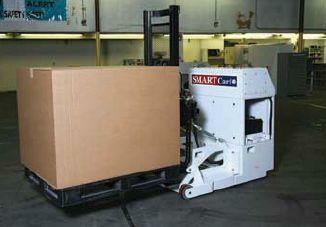 SmartCart AGCs are ideal for moving products on an assembly line or transporting goods throughout a plant or warehouse. Because they’re automatic and durable, automatic guided carts provide reliable and consistent point-to-point movement of everything from small parts to heavy pallets. Why Use Automatic Guided Carts? All the while delivering meaningful year-after-year cost reduction to your bottom line. For warehouses and distribution centers, SmartCart offers a wide range of tuggers, which can tow loads anywhere from 60 pounds to 6,000 pounds (based on a trailer friction factor of 2%). SmartCart also includes options for a single or dual roller conveyor AGC, which is useful for delivering pallets (as large as 60″) to and from roller conveyor systems. for repetitively moving work-in-process (WIP) materials between production and buffering areas. The SmartCart Model 300CF counterbalanced fork type AGC is perfect for picking up and dropping off pallets from conveyors, stretch wrappers or the floor. 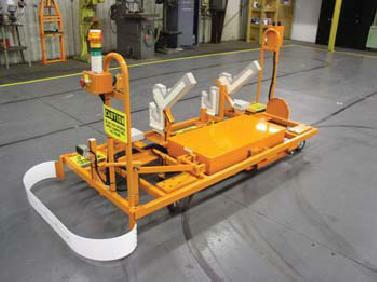 AGC’s can run in a simple loop without upper level computer controls, or a “Cart Management System” (CMS) allows the carts to operate in complex layouts with computer blocking controls and to interface with other in-plant systems. The Windows based CMS cart controller allows the user to reconfigure carts easily, through drop down menus. 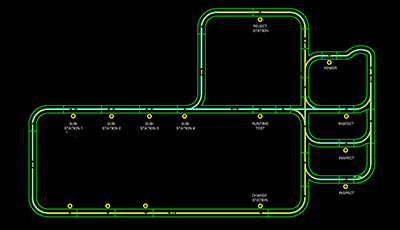 Modified guidepath layouts and cart functions can be downloaded via Wi-Fi radio signal to the carts in seconds. An Automatic Guided Cart graphical monitoring screen with simple and intuitive operator interface is available for the CMS controller – providing your operations and maintenance personnel complete control and access to your assembly line. Multiple graphic screens can be easily located anywhere with network access to the CMS. to your bottom line, improve your system operation, and provide a more friendly work environment for your most valuable asset – your employees. A SmartCart AGC system can be installed in one area of your facility today, and quite easily moved and retooled to another in the future. 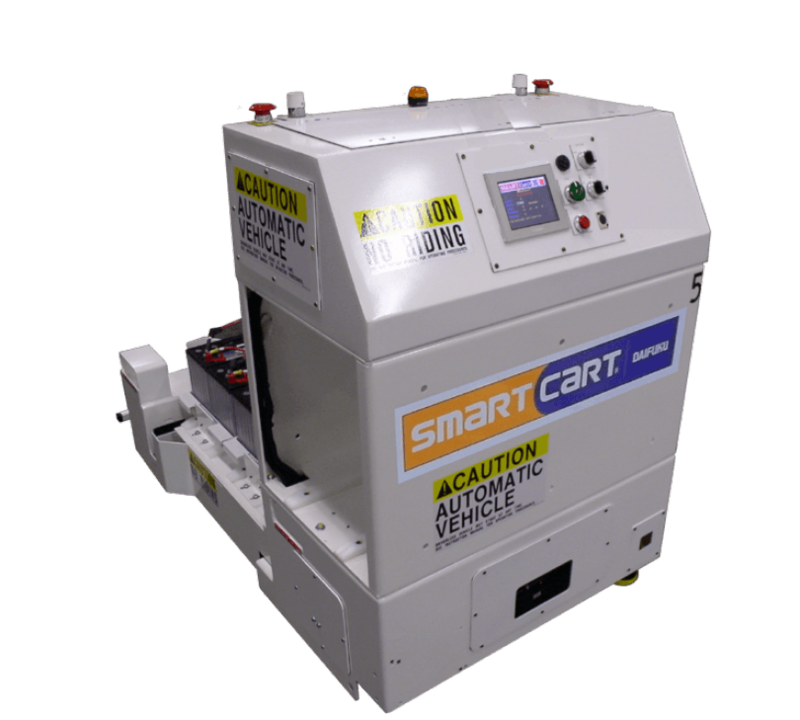 A SmartCart AGC module is like an engine in an automobile; changing the outer “load handling fixture” changes its purpose while allowing you to preserve your core investment. 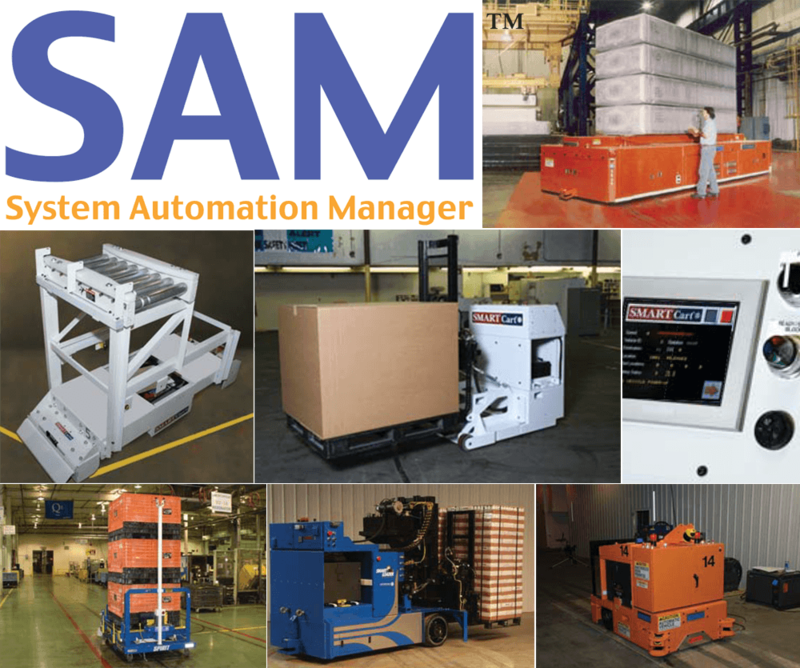 Your automation can change as quickly as market conditions – keeping you ahead of your competitors. Magnetic tape and flat transponder tags are about a 1/16″ thick, so they can mount “on” the floor, with no need for drilling or cutting. Installation is as easy as: sweep the floor, measure and snap some chalk lines, mark your turn radii, stick down your tape and transponders, and run your SmartCart AGCs. Floor mounted conveyor can impede access. But since all of the floor level installation is noninvasive, SmartCart AGC systems create orchestrated traffic without impeding access to your work areas. AGC batteries can be automatically charged, providing nearly maintenance free power delivery for your assembly conveyor. And, power consumption is lower with a SmartCart AGC assembly line than with a continuous moving drive chain conveyor – translating into lower operating costs and an improvement in your company’s green footprint.